Three days after surgery and I’m opening a handful of medical bills…already. The labs, surgeons, offices, (and perhaps even the building security, who knows) have not wasted any time in calculating the costs to dissect me. The brows are not furrowing, nor am I tapping my fingers on the table in my nervous manner. I set the bills aside and just know they need to be paid, sooner rather than later so the bright pink envelopes don’t start coming. This was anticipated and perfectly timed. My midsection is bloated and aches of a dull, consistent pain but my skin is still sun-kissed and my brain (for the most part) is still savoring a much-needed vacation home to the Philippines. The trip began with the funeral of my beloved aunt, Diday. Her death was unexpected and other than my sister’s passing, hers has been the most difficult one I’ve had to really face. Did I communicate with her as much as I could have in her final years? Did I demonstrate my love for her as much as I could have? No and no. I know. You’re thinking ~ this trip does not sound like a whole barrel of fun quite yet. Her life and death taught me a lot. Love, laughter, and family…and not to dwell on what I cannot fix. Only what I can. And what matters. Because really, that’s all we should make time for ~ life is too short for everything else that does not matter. So I soaked everything in and enjoyed my time home as much as I possibly could. My brother, Les, and nephew, Avery, made it home as well so we tried to spend as much quality time with our parents as we could. [My parents, by the way, were the best, most patient hosts ~ shuttling us all over Manila, catering to our every need…it’s really quite a wonder we can manage without them on a daily basis!] There was lots of shopping time for the girls, an aquarium in the mix, and what would a vacation in th tropics be without pool time?! And…what would a vacation to the Philippines be without ripe mango shakes, taho (a tapioca/sweet tofu drink), buko pies, and fresh chicharrones (this visit we tried fish skin – YUM). I thoroughly enjoyed visiting my family and hugged them as tight as I could, recalling memories from my childhood. I knew I may not see some of them again (I choked down the tears and kept them until no one else was in sight). We visited our family cemetery in my father’s province on my sister’s birthday and lit candles and laid down flowers. We travelled the country side and swam with a school of fish. I was privileged (and thrilled to bits!) to visit the Farmer’s Market in Cubao with my mom and cousin, Alan. I did not get to see everyone but I did get to see some of my very best friends on this visit and I was reminded that the distance and years has not made me love these people any less ~ they, too, are like my family. In fact, as I laughed with them and tried to catch up on years gone by (as I savored my fresh mango or banana shake), I knew these people would be in my life for as long as they would have me. Some people go back home and are glad they moved away. I was glad to have come back home and shared the experience with Otis and the girls. I was so at peace to be there with them. Being home was the spoonful of sugar I needed before coming back to reality. In fact, it was the clearer, more peaceful dose of reality I needed; one which offered a sense of calm and timelessness we so often do not have in our everyday lives. The picture I am posting is not of the trip. There are too many beautiful ones to post. This one was given to me by one of my best cousins, May. 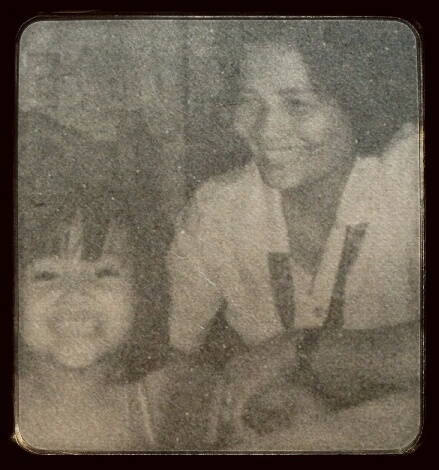 It is of me and my aunt, Diday, obviously taken many, many moons ago. Diday posted this in a book she wrote and the picture reminds me of the trip and what I want to take from it…love, laughter, and family.